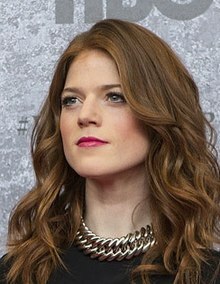 Rose Eleanor Arbuthnot-Leslie (born 9 Februar 1987), kent perfaisionally as Rose Leslie, is a Scots actress. Efter winnin a Scots BAFTA for Best Actin Performance for her role in New Town, she rose tae fame as Gwen Dawson in the ITV drama series Downton Abbey an as Ygritte in the HBO fantasie series Game of Thrones. She currently is Maia Rindell in the CBS All Access legal an poleetical drama The Good Fight. ↑ "Game of Thrones Stars in London". The Resident. 27 February 2015. Retrieved 6 January 2016. ↑ 2.0 2.1 "Rose Leslie – Hamilton Hodell – CV". www.hamiltonhodell.co.uk. Retrieved 17 February 2016. ↑ 3.0 3.1 "Rose Leslie". TVGuide.com. Archived frae the oreeginal on 13 September 2015. Retrieved 4 April 2016.